Parents: Ernst Friedrich and Maria Ludmilla (née Stremayr) Böhme, died 1902 and 1903 respectively in Leoben, Steiermark. Wife: Married Romana Maria Hüller von Hüllenried (daughter of Generalmajor Karl Rudolf Hüller von Hüllenried) on 29 June 1929 in Graz. Brother: Ernst Böhme, State Councillor in Bruck am Mur. 1892-1896: Attended four classes at the Volksschule (Elementary School) in Villach (Kärnten). 1896-1900: Attended four classes at Gymnasium (High School) in Villach (Kärnten) and Leoben (Steiermark). 1 October 1900-18 August 1904: Zögling [Cadet] in the Infantry Cadet School in Libenau near Graz. 18 August 1904: Entered the Austro-Hungarian Army as a Kadett-Offiziersstellvertreter [Cadet Deputy Officer] and Platoon Commander in Infanterieregiment von Kövess Nr.95. 1 October 1910: Instruction Officer at the One-Year Volunteer School of Infantry Regiment 95, Lemberg. 1 October 1911: Assigned to the War School in Wien. 10 August 1912: Detached for one month from the War School for troop service in Feldkanonenregiment Nr.14. 1 August 1913: Detached for1½ months from the War School for troop service with Dragonerregiment Eugen Prinz von Savoyen Nr.13. 31 July 1914: Assigned to the General Staff. 3 August 1914: Operations Officer (Ia) in the General Staff of Fortress Command Halicz/East Galicia. 6 September 1914: Assigned as a General Staff Officer in the Command of the Royal 38th Hungarian Honved Division. 10 March 1915: Operations Officer (Ia) in the General Staff of the 131st Infantry Brigade. 2 June 1915: Operations Officer (Ia) in the General Staff of the 132nd Infantry Brigade. 1 September 1915: While retaining his previous command, transferred to the General Staff. 24 December 1916: Operations Officer (Ia) in the General Staff of the XXIV Corps Command. 23 February 1917: Chief Supply Officer (Ib) and Intelligence Officer (Ic) in the General Staff of the Prussian General Command for Special Employment 51. 26 May 1917: Operations Officer (Ia) in the General Staff of the Section Command IIa (XXIV Corps). 22 November 1917: General Staff Officer in the Command of the Second Isonzo Army. 25 December 1917: General Staff Officer in the Command of the First Isonzo Army. 22 May 1918: General Staff Officer in the Royal and Imperial Army High Command. 28 August 1918: General Staff Officer of the 1st Infantry Division. 28 December 1918: Transferred to Feldjäger-Bataillon 1. 1919: Transferred to People’s Defence Battalion 6, Bruck II, later, Leoben. 20 September 1920: Accepted into the Austrian Federal Army; assigned as a Platoon Commander in Alpenjäger-Regiment 10. 9 March 1921: Detached provisionally to the 3rd Brigade Command. 16 April 1921: Deputy Chief of Staff of the 3rd Brigade Command, St. Pölten. 1 December 1922: Detached as Officer on Staff of the 5th Brigade Command, Graz. 1 December 1923: Deputy Staff Chief in the 5th Brigade Command, Graz. 1 January 1927: Chief of Staff of the 5th Brigade Command, Graz. 1 April 1928-31 May 1928: At the same time, detached to troop service in the 5th Brigade Artillery Battalion. 1 June 1928-31 October 1929: At the same time, detached to troop service in Steirisches Alpenjägerregiment Feldmarschall Conrad von Hötzendorf Nr.10. 1 February 1930: Director of the Army Administration Office in Eisenstadt. 1 February 1931: Chief of Staff of the 3rd Brigade Command, St. Pölten. 1 December 1933: Consultant in the 2nd Department of the Federal Ministry of National Defence. 1 January 1935: Director of Department 1/A (Abwehr or Intelligence Service) of the Federal Ministry of National Defence. 1 June 1935: Director of the Signals Department of the Federal Ministry of National Defence. 2 March 1938: At the same time, also named Chief of the General Staff of the Austrian Federal Army. 16 March 1938: Accepted into the German Army and appointed Director of Section III in the Federal Ministry of National Defence. 1 July 1938: Detached to the 23rd Division. 1 August 1938: Officer for Special Employment to the Commander-in-Chief of the Army. 10 November 1938: Infantry Commander 23 and, at the same time, Garrison Senior in Brandenburg/Havel. 1 July 1939: Commander of the 30th Infantry Division. 19 July 1939: Commander of the 32nd Infantry Division. [Böhme’s division took part in the invasions of Poland in September 1939 and France in May-June 1940]. 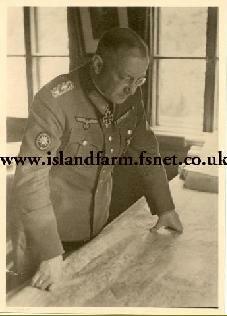 5-28 September 1939: At the same time, delegated with the leadership of II Army Corps. 16 September 1941-2 December 1941: At the same time, Commanding General and Commander of Serbia. 10 December 1943: Deputy Commanding General of the XVIII Army Corps and Commander of Wehrkreis [Military District] XVIII, Salzburg. 15 July 1944: Badly injured in a flying accident in a Fieseler Storch aircraft. 16 October 1945-29 May 1947: Prisoner of war in British and then Allied captivity. 26 July 1946: Transferred to the London District Cage (LDC) from Island Farm Special Camp 11. 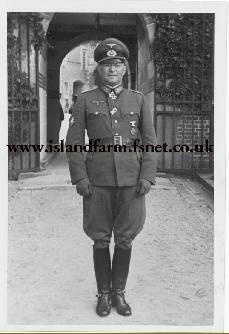 18 September 1946: Transferred to Island Farm Special Camp 11 from the LDC. 29 May 1947: Committed suicide by jumping from the fourth floor of Nürnberg Prison. 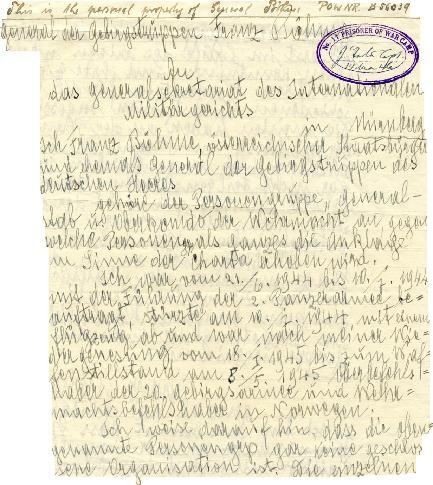 An interesting letter, in German, from Bohme...his hand writing is pretty legible! It appears he sent this letter to the International Military Court (that would eventually try him) with the intent of establishing certain facts about his career. He opens (roughly) with "I, Franz Bohme, an Austrian holding the rank of General der Gebirgstruppe in the German Armed Forces." He made sure to state he was an Austrian ! 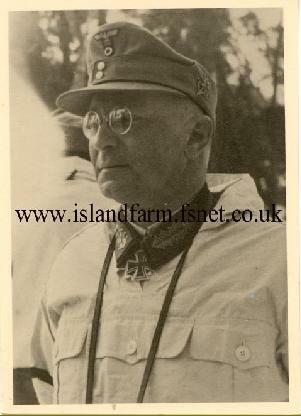 He goes on to say that from 21 June 1944 to 10 July 1944, he was delegated with leadership of the 2d Panzer Army but then had an accident (see his profile). From 18 January 1945 until the ceasefire on 8 May 1945, he was Commander-in-Chief of the 20th Mountain Army and Armed Forces Commander-in-Chief of Norway. I think he also states that his career information can be checked in his personnel record (he was probably reciting these dates from memory...he was pretty accurate too!). Knight’s Cross of the Iron Cross: 29 June 1940, Generalleutnant, Commander of the 32nd Infantry Division. German Cross in Gold: 10 February 1944, General der Infanterie, Commanding General of XVIII Mountain Army Corps. Prussian Iron Cross, 1st Class (1914): 12 June 1917. Prussian Iron Cross, 2nd Class (1914): 1916. 1939 Clasp to the Prussian Iron Cross, 1st Class: 25 September 1939. 1939 Clasp to the Prussian Iron Cross, 2nd Class: 12 September 1939. Austrian Military Merit Cross, 3rd Class with War Decoration and Swords (two awards). Austrian Military Jubilee Cross: 2 December 1908. Austrian War Commemorative Medal with Swords: 19 June 1933. Golden Decoration for Services to the Austrian Republic (Goldenes Ehrenzeichen für Verdienste um die Republik Österreich): 23 December 1933 – The decorations of the First Austrian Republic (1918-1938) were not permitted to be worn after the Anschluss (Union) with Germany in March 1938. Order of the Crown of Italy, Grand Officer: 21 January 1938. Bulgarian Military Merit Order, 1st Class with War Decoration: 8 August 1941. Hungarian Order of Merit, Commander’s Cross: 1936. Hungarian Order of Merit, Commander’s Cross with Star on the War Ribbon with Swords: 19 June 1941. Finnish Order of the Cross of Liberty, 1st Class with Oakleaf and Swords: 13 May 1943. 1914: East Galicia (Royal 38th Hungarian Honved Division): Combat at Halicz and Bolszowce; Second Battle of Lemberg; Combat in the Carpathians at Szinna, Uszoker Pass, Turka and Boryslaw. West Galicia: Battle of Limanova. 1915: East Galicia (in the German South Army): Combat in the Carpathians at Beskiden and Zwinin; Battles of Steryj, Halicz and Tarnopol; Combat on the Strypa River. 1916: East Galicia (in the German South Army): Combat on the Strypa River at Burkanow; Combat on the Zlota-Lipa at Brzezany. 1917: Volhynien-Russia (XXIV Corps): Combat southeast of Vladimir Volynsk (Novi Zagorow). Courland (Prussian General Command for Special Employment 51): Combat at Dünaburg and at Jakobstadt. Italy (XXIV Corps and Second Isonzo Army): 10th, 11th and 12th Isonzo Battles; Advance on the Piave. 1918: Italy (First Isonzo Army): Combat on the Piave River. France (Austrian 1st Division): Defensive Battle on the eastern Maas before Verdun with the Prussian V Reserve Corps. Blau, George E. The German Campaign in the Balkans (Spring 1941). U.S. Department of the Army. Historical Study, Pamphlet No. 20-260, November 1953. Personal-Nachweis/Dienstlaufbahn for General der Gebirgstruppe Franz Böhme detailing his military career from 1 October 1900-16 March 1938. 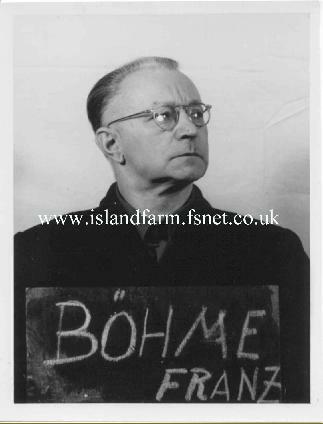 Prisoner of War File Card for General der Gebirgstruppe Franz Böhme prepared by Captain Edward “Ted” Lees, camp intelligence officer and interrogator, Island Farm Special Camp 11. 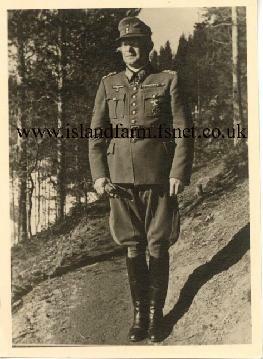 Click here to see a photo of General der Gebirgstruppe Franz Böhme (Franz Boehme) in the company of fellow prisoners of war at Island Farm.